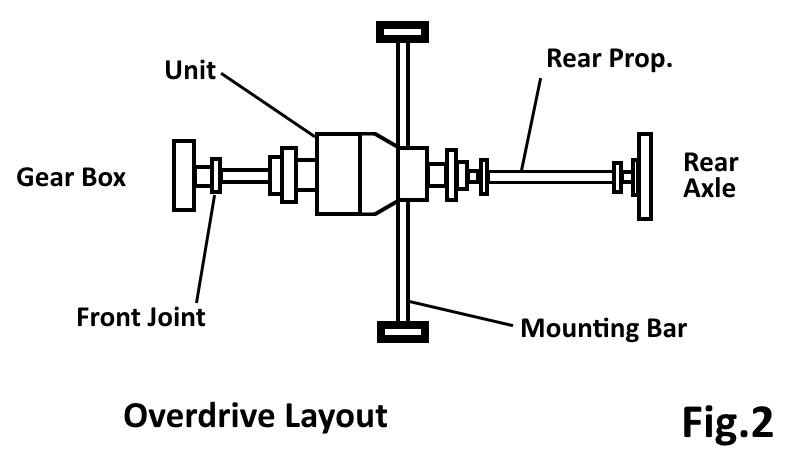 An Overdrive may be most easily described as an extra, or normally fifth, gear, and although it may technically be used to make a vehicle go faster, that does not realise its correct potential. Indeed, with some cars being equipped with more engine power than stopping ability it may even be dangerous to misuse it in this way. If an overdrive is used to reduce engine revolutions when cruising speed has been attained in top gear, the benefits are numerous. Probably the most obvious of these is the fuel saving. In normal use this can be expected to be of the order of ten percent, but with care may be pushed up to well in excess of fifteen percent and if the fuel consumption / engine speed graph were linear, a comparative steady speed test should give twenty eight percent saving - but of course life does not consist of linear graphs and steady state conditions! A less immediately obvious benefit is the potential engine and transmission wear reduction. As the car travels further, with an overdrive fitted, for the same number of engine revolutions as without, the engine and gearbox must wear out more slowly. This not only extends the life of valued components, but puts off the ugly day when a full power train strip down makes inroads into the bank balance. The third benefit is even less quantifiable, but is perhaps the most pleasing aspect of using an overdrive. It depends less on theory and calculation and more on the discerning driver and the local County Council. It is not only the cars that have developed over the years, but the roads that they run on are now straighter, less interrupted and smoother, and although even early cars may be capable of a respectable turn of speed, they possibly had little chance of doing so for more than short bursts on most of the roads of their time. Today, however, what with junction modifications and the straightening out of bends, even British "B" roads will usually allow a reasonable cruising speed for a reasonable period of time - relatively. The use of an overdrive then allows the engine to relax on the longer straight runs and, hopefully, enhances the pleasure of driving. The unit used by Tim Payne Overdrive Designs Ltd is the "Laycock J" or "2XP" type as was manufactured by Laycocks of Coventry, and which is still in production today. This is a well proven design of many years standing and has been fitted to numerous types of vehicle. 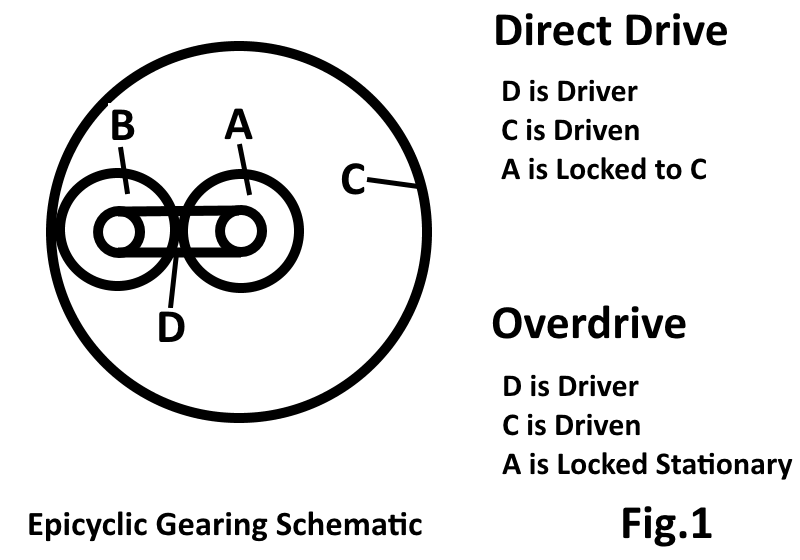 It is an epicyclic gearing arrangement, (see Fig 1 below), with a cone clutch either locking the input shaft to the output shaft for direct drive, or locking the centre gear to the case, thereby dictating that the gears on the input shaft rotate not only around their own axis, but also around the inner gear, so forcing the output shaft to rotate faster than the input. This is pleasant from an engineering aspect as the loads are distributed within the gear structure, and not via main support bearings as is the case with a conventional fixed centre gear arrangement. A cam is attached to the input shaft and this cam operates a hydraulic pump, the lubricating oil doubling up as the hydraulic power medium. When the operating switch makes contact, a solenoid is actuated which moves a valve allowing the hydraulic pressure to engage the cone clutch via a pair of pistons. By the addition of a flanged input shaft and front closing plate the unit is made up into a self contained gearbox, complete with breather, filler, level and drain plugs. The closed unit is then mounted in a carrying cradle and this is suspended on two rubber mounts on a cross bar which clamps to the vehicle chassis. A third supporting point is the drive shaft connecting the overdrive to the gearbox. This shaft includes either a stainless steel flexible coupling, or a single universal or Hooks joint. Both these couplings give excellent axial alignment whilst allowing an element of angular offset, as may be experienced by chassis flex. This fitting arrangement (see Fig 2 below) borrows something from the principle of the three legged stool; it is inherently stable and compact and the mounting points do not run away from their responsibilities by overloading one of their fellows. Although this was chosen as the most suitable configuration, a thorough understanding of the interaction of the components and some precise machining is required to ensure the assembly of a unit which is smooth and reliable. A conventional prop. shaft then runs from the rear of the overdrive to the rear axle of the car. To allow the speedometer to work correctly in all gears including overdrive, the speedometer drive at the rear of the unit is used, and attached to the existing cable via an adaptor box. The adaptor box is calibrated to also take into account any variations in tyre size or axle ratio and can allow for any calibration drift which may have crept into the speedometer instrument over time. The main criteria for fitting an overdrive are that there is sufficient room under the car, and that there is a minimum of 38" of prop. shaft. Having said that, development is under way for a system for use on the Torque tube Silver Ghost and Phantom I cars. The same principle is used, but with the overdrive mounted inside a "Torque Box" which replaces the front half of the Torque tube. It is a policy to avoid, as far as possible, altering the vehicle components, so allowing the car to be easily returned to original condition with no evidence that it had been "tampered with". With the 3 1/2 and 4 1/4 Derby models it is necessary to drill a hole for mounting an interlock switch near the gear lever, but this would never be done without the approval of the customer. Certainly cutting prop. shafts, welding brackets onto the chassis and modifying the bodywork are definitely not considered to be options. Only high quality components are used and, as far as possible, parts are nickel plated or powder coat painted.